If you have read Rachel's description of Graeme you will realise that he was a very keen sportsman. He played hockey and five-a-side football on a regular basis and keenly followed most sports, having a detailed knowledge of many. Graeme would probably be the first to admit that he was not the best player but nobody could fault his commitment and enthusiasm in anything that he played. He wanted to win and his desire to do so sometimes got him into trouble with referees and resulted in more than one red card and being asked to leave the field of play. He rarely complained about such decisions and accepted his fate and punishment with good grace. Graeme believed that it was his duty to try to win and berated fellow players if he did not think that they were pulling their weight. As Rachel mentioned Graeme captained the Hockey Club's fifth team at Stockton and promoted the youngsters whom he knew would be the future of the club. The first award to be given in Graeme's memory was in 2007. 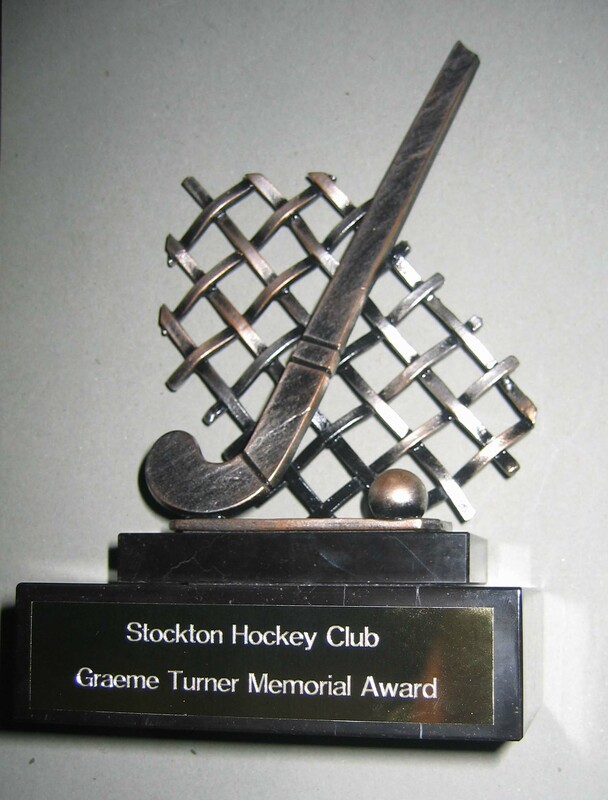 Stockton Hockey Club wanted to do something in memory of Graeme and so Graeme's family donated an award to be presented to the person who has shown enthusiasm for the game and especially for promoting the younger players. A photo of this is shown below. In September 2008 Graeme's family were contacted by the secretary of the five-s-side football league at Billingam Forum where Graeme and his friends had played for many years. Their team's main claim to fame was its ability to change its name on a regular basis. Rumours were that this was done to prevent retribution from other teams. The secretary said that the league's group of referees wanted to present two awards in Graeme's memory; one for each division. 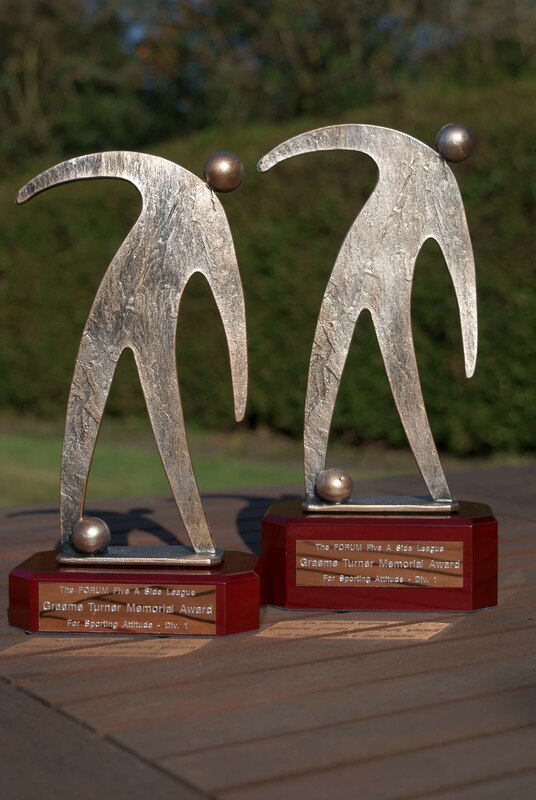 The awards are to be known as "The Graeme Turner Memorial Award for Sporting Attitude". They are to be given to a player in each league who gains the most nominations from referees during the season. The referees were looking for players who play fair, show some skill, accept decisions of referees and promote a positive, competitive but friendly attitude in games. Graeme's family were very proud to have been asked about this award. This was especially so because the league referees remembered Graeme so well two years after he died. The first award was given for the season 2008-2009 at the annual awards night on 11th July 2009. Graeme's parents were invited to present the awards but unfortunately could not attend. The awards for the season 2009-2010 were presented on Saturday 17th July. Graeme's Dad Keith went along to present Graeme's Memorial award and was also asked to present many of the other awards. Keith recounted Graeme's story and then presented the two winners with a Team Graeme tee-shirt along with the trophies. At the end of the evening the league secretary then presented Keith with a cheque for £257.32 for our charity fund. This generous donation was a share of the monies that the teams had raised over the season from raffles and was very gratefully received by Keith. The photo below shows the awards for Division 1. The smaller of the two is to be kept by the winner while the larger is retained by the winner for one year. The Division 2 awards are identical. We hope that you agree that they are an impressive and lovely tribute to Graeme. All of these awards are a lovely reminder of how much people thought of Graeme and they make his family extremely proud of him. They show that Graeme's attitude to playing these sports has made a positive impact on people and persuaded them to do something in his memory. When the family were asked about the first award they wanted something unusual. They did not want the usual plaques, cups, medals or trophies. After many weeks of searching they came across a company called Awards Online based near Barnard Castle. The company produces a very unusual range of awards and these were exactly the type of award that Keith, Anne and Rachel wanted. To see the full range of awards please click on the logo and if you do order anything please tell them we sent you.